Have you ever wondered… What types of foster care payments are taxable? Can you take a foster child as a dependent? Are there benefits for kinship providers? 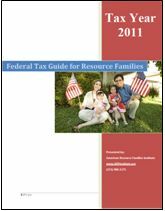 Are there tax deductions available to foster parents? What expenses are deductable? What is the Adoption Credit? Join us as we explore the wonderful world of taxes and foster care. Please forward to resource families… thank you.